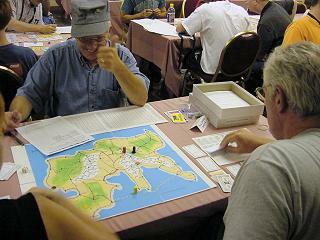 Sixty-six U.S. and Canadian sweated and froze, experienced unexpected victories, or stared in disbelief as the evil dice snatched away certain victory in Rail Baron. 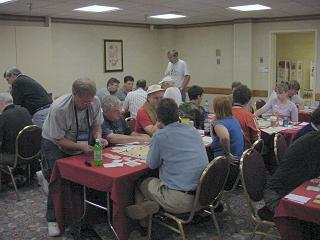 There was, no doubt, such a tale at each table all the way to the final game. Congratulations to the winner of this year's tournament, Doug Galullo. 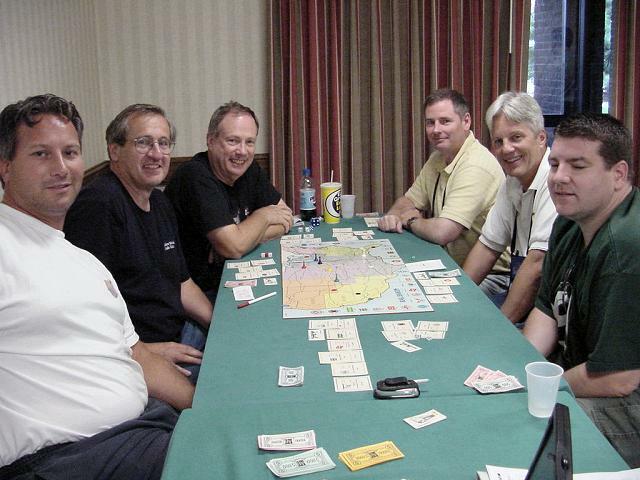 Also playing in the final game, finishing in ranking order (net worth): Brian Conlon, Larry Kratz, Phil White, Mike Brophy, yours truly, GM Ron Secunda, who, I might add, was happy just to not go bankrupt and remain in the game to the end. Finalists, from a field of 66, pictured from left to right: Doug Galullo, Larry Kratz, Ron Secunda, Brian Conlon, Mike Brophy, and Phil White. The order of play for the final was Phil, Doug, Larry, Ron, Brian, and Mike. Departing from their homes the howl was "Westward Ho," as each player headed in a safe, westerly direction. 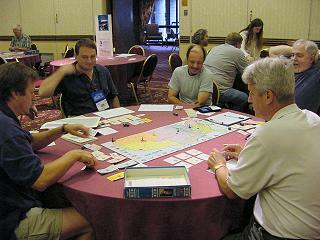 As each player arrived, the predictable railroads were grabbed up. In order of purchase, PA (Brian), NYC (Larry), B&O (Ron), C&O (Mike), SAL (Doug). 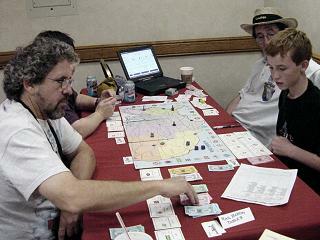 Whereas the initial movement was to the west, the players clearly sought the eastern railroads. Brian quickly added the ACL, Phil grabbed the SOU, Larry the L&N, and Ron the NYNH. Doug was first at the western Big Three, selecting the ATSF, and also picked up the RF&P. Brian followed by capturing the SP and upgraded to an express. Phil managed to buy the UP. Mike acquired the WP and DRG&W, upgraded to an express, and purchased the B&M. By mid-game, Phil was holding the SOU, UP, NP and N&W as well as an express. Doug, holding the ATSF, SAL, and RF&P, was locked out of the Northeast but endured a trip to hostile New York; he then received a safe, long trip to San Francisco on his ATSF, and upon arrival added the CMStP&P. Larry survived a trip to very hostile Miami, managed to upgrade to an express, and later added the GN, C&NW, and T&P to his NYC & L&N. After Ron returned from San Francisco to Memphis and purchased the NYNH, he next traveled slowly to friendly, nearby destinations, upgraded to an Express, and was then the first to upgrade to a Superchief. Brian, holding the PA, SP, and ACL, was the only player with both a major NE and SW railroad; he found himself traveling to Doug's hostile San Diego, but then had a friendly trip to Kansas City. Mike, after a trip to hostile New York, next traveled to Minneapolis, and purchased the GM&O. Now the game really got interesting. Brian departed Kansas City for San Francisco, and upon arriving, purchased the CB&Q. Had this been a chess match, that decision would have been noted with a question mark because only the CRI&P and MP remained available to connect Brian's big railroads. Doug, having left San Francisco, now found himself en route to Louisville, with only one non-hostile RR left to ride in on, the IC. Ron, having arrived in New Orleans, and finding himself trailing all other players in RR acquisitions, snatched the IC, which connected to his B&O, in hopes of cashing in on Doug's arrival at Louisville. Doug initially expressed a non-willingness to accommodate Ron, but relented when Ron's next destination was a very hostile San Francisco. Thus a symbiotic relationship ensued. Doug arrived in Louisville, paid Ron, and bought the SLSF, breathing a sigh of relief, as it gave him the last available connection into his SAL. Next, Ron arrived in San Francisco and, in an act of desperation, purchased the CRI&P. 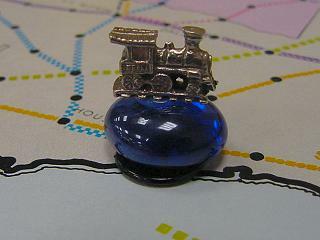 Mike soon purchased the last railroad available, the MP, which connected his eastern and western RRs. This turn of events left Brian with no connection from his PA+CB&Q to his SP or his ACL. 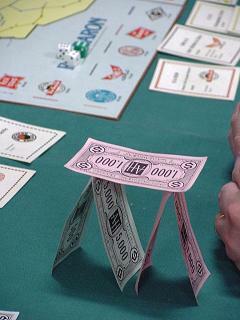 Due to the jump in railroad use fees, immediately more than one player found himself strapped for cash. Only Doug had saved some dough for the inevitable auctions. He won the WP from Mike for $22,000, plus the B&M for $8,000. Doug also won the NYNH from Ron for $10,000. At this point the networks, with access and monopoly percentages, were as follows: Phil: SOU UP NP NW (38.2%, 3.2%), Doug: SAL ATSF RF&P CMStP&P SLSF WP B&M NYNH (60.7%, 7.4%), Larry: NYC L&N GN C&NW T&P (48.5%, 2.0%), Ron: B&O IC CRIP (31.8%, 0.7%), Brian: PA ACL SP CBQ (65.4%, 0.0%), Mike: C&O DRG&W GMO MP (28.3%, 0.0%). Clearly Doug was in the best position, even without a major Northeast railroad. Brian's network service percentage was tops, but the lack of connections was a big problem. Larry could not be counted out because he had an excellent route between the Northeast and Northwest. Indeed, both Larry and Brian announced, but Doug was able to amass the most cash, thanks, in part, to collecting about $70,000 in use fees from the B&M NYNH combo. In the "end game," Doug, sitting in Albany, declared for Home (Louisville), but rolled only half of the 10 he needed. Click the image at left to watch a video of the fateful roll (can anyone recommend software to rotate MPG videos by 90 degrees?). Doug was rovered and had to proceed to his alternate destination, Sacramento. His next destination, however, was Chicago, and then he easily made it home to Louisville. The Rail Baron tournament would not have been possible without the contributions of my assistant GMs, Chester Lanham, Paul Van Bloem, and especially Steve Okonski, without whose help it couldn't have happened. Additionally, Steve was recognized for a significant accomplishment at the 2004 tournament, and a gift was presented to him just before the commencement of the final game. The award was given for an unprecedented win record in RB first-round heats: Steve not only won all three he entered, but then also voluntarily filled in for another player (who had to drive a friend to a hospital) in another first-round heat. The player was already in the lead, and Steve won that game also. Some interesting statistics: 87% of the players who made it into the semi-final game started playing on the first day first-round heat, 13% made it in by starting on the second day, and no players who entered the tournament at the third first-round-heat made it into the semi-final game. Twenty-four winners advanced to the semi-finals, and to fill out the 5-person 5-table semi-final, one first-round alternate, your GM (with $500,000 net worth) advanced to that seat. In addition, three first-round winners were unavailable for the semis and forfeited their seats to the next two alternates: Charlie Davis ($481,500) and Jeri Freedman ($443,500). Moving down the list of alternates present, Rod Davidson ($341,500) snagged the last seat. The five semi-final game winners were joined at the final round 6-player table by the first alternate; you guessed it, your GM again ($392,000). Hoping for a no-show at the final were the remaining alternates: Francis Deveraux ($347,000), Stan Buck ($336,000), Steve Okonski ($331,000), Donna Balkan ($312,000), and Chuck Foster ($307,000).